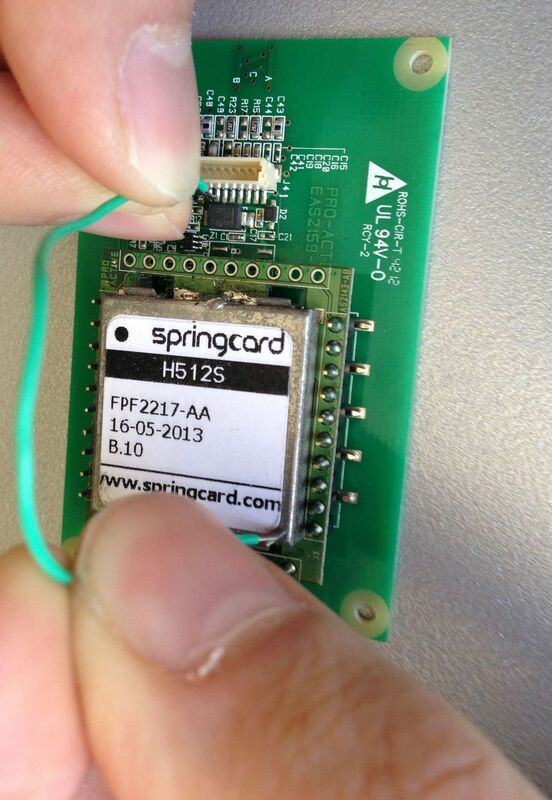 SpringCard H663 and H512 families are a group of NFC devices / contactless smartcard readers. 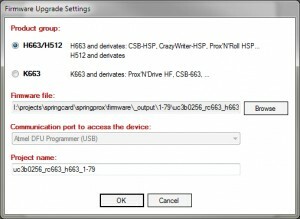 This document explains how to upgrade their firmware, using the new SpringCard Firmware Upgrade Utility. Linux/Mac/Unix users are welcomed to use the open-source DFU-Programmer provided by Atmel and contributors and available at http://dfu-programmer.sourceforge.net/ . SpringCard H663 and H512 use the at32uc3b0256 chip. The SpringCard Firmware Utility 2013 works on Windows XP/Vista/7/8, on both x86 and x64 releases. The microcontroller used by SpringCard H663 and H512 families is an Atmel AVR32 (AT320UC3B0256). This microcontroller is upgradeable on the field, through its USB link. A driver is provided by Atmel to connect the microcontroller through USB, using the USB DFU (Device Firmware Upgrade) standard. The SpringCard SU13168 package contains release 1.2.2 of Atmel USB Driver for DFU. For any issue related to the driver itself, please visit http://dfu-programmer.sourceforge.net/ and http://sourceforge.net/projects/dfu-programmer/ do download a newer version or to look for support. The FUU software make uses of pieces of source code released under various open-source licences, including the GNU Public Licence (GPL). To comply with the GPL, the FUU software it itself released under the GPL. Check “source code to the open-source components” during install to get the source code. The subdirectories are named after the version (for instance http://files.springcard.com/firmwares/springprox/1-74 stores all the firmware in the 1.74 branch). Download the firmware you want to use and save it locally on your hard drive. H663 firmware for H663S, H663A, H663-USB, CrazyWriter-HSP, CSB-HSP. When you launch the software for the first time, the list of Existing Projects is empty. Check Create a new Project, and click OK. Check Product group: H663/H512. The software opens a dialog box to let you select the firmware you want to put into the product (click Browse if the dialog box doesn’t open automatically). 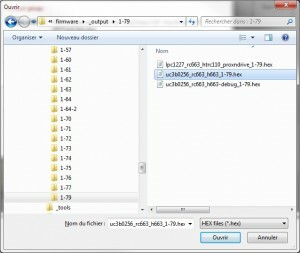 Browse to the folder where you have downloaded the firmware earlier, and select the firmware file (extension is .HEX). Back to the “Firmware Upgrade Settings” box, note that a Project Name has been generated from the name of the firmware file. You may change the name, or just proceed by clicking OK. Put the device into Flash Mode (see below for a detailed procedure, depending on the hardware). Wait until the USB driver “Atmel DFU for AT32UC3B” is installed and activated by Windows. Click Flash under the File menu. The procedure takes less than 20 seconds to terminate. Don’t forget to put the reader back into operation mode! In case the software says “No DFU device found”, please open Windows’ Device Manager, and check that your device is listed as “Atmel USB” and without error mark. If an error mark is present –> check the DFU USB Driver version, contact developers of the driver for support. 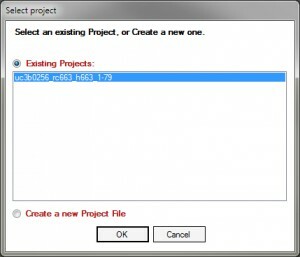 Once a Project has been created, FUU allows you to re-open it later on. 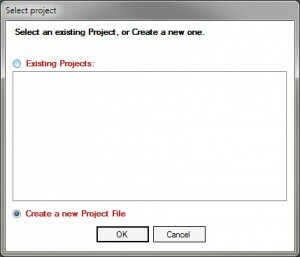 Make sure the Existing Projects box is checked, select the Project in the list and click OK.
You may also double-click the Project you want in the list. 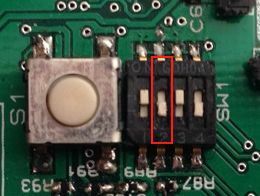 Tie the /FLASH pin to GND before resetting (or powering up) the device to make it starts on its DFU bootloader. 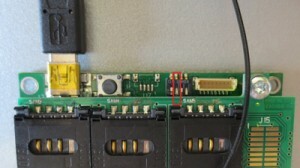 Use the method depicted below for the bare modules, or shunt pins 1 and 7 on the JST connector. Locate the 4 configuration switches and set them to ON ON ON OFF to load the firmware. Remember to put the switches back to normal position ON OFF ON OFF afterwards. Remove the 4 screws to open the product’s shell. Pay attention when closing the shell that the screws at the front are shorter than the screws at the back!